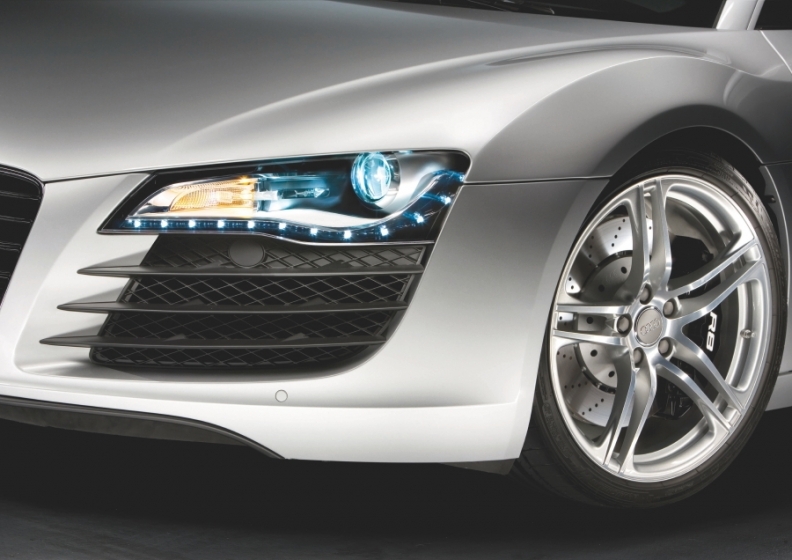 Automotive Lighting's full LED headlamps are on the Audi R8 (shown) and A7, and the new Mercedes CLS. Often taken for granted by drivers, the simple headlight has been evolving with new technology that makes it not just a lamp, but also a major design feature and a future contributor to better fuel economy for the car. Premium vehicles show the road ahead for high-tech forward lighting, particularly the use of full light-emitting diode (LED) headlight modules. The use of xenon high-intensity discharge lamps, meanwhile, continues to expand in the luxury and near-luxury fleets. Both systems produce a brilliant blue-white light that is closer to daylight than that made by conventional halogen bulbs. Arne Behlmer, IHS Automotive lighting and component analyst based in Frankfurt, said global LED headlamp penetration is still expected to be very small, less than 100,000 units per year in 2013 in a 20 million vehicle market. Only four premium European vehicles carry full LED headlights. Some premium imports, such as the Lexus LS, also have full LEDs while partial LED systems appear on the Toyota Prius hybrid and the Nissan Leaf compact electric car. He said that xenon lighting has spread much farther than LEDs, with up to 80 percent of large premium vehicles using it. The high cost of xenon systems has limited their appeal in compact cars, and has kept subcompact segment adoption at far less than 10 percent. Traditional fourth-generation halogen systems are so reliable and inexpensive that they will continue to dominate mass-market vehicle segments, with greater than 50 percent market share for the foreseeable future, say automotive analysts and lighting suppliers. Recent design changes to meet European pedestrian crash safety rules have led to taller and larger front ends, benefiting halogen lights by allowing a higher mounting point and larger reflectors. With so much fourth-generation halogen dominance, why are light makers excited about LED systems? Partly it's because lights are one of the few areas where carmakers can quickly change a car's overall look. "The basic shapes of vehicles have not changed much in the past 15 years, but in details like lighting you can particularly see design progress," Behlmer said. Klaus Mataushek, director of business development for Automotive Lighting, the wholly owned subsidiary of Fiat-owned Magneti Marelli S.p.A., said LED lights offer styling advantages over conventional single-bulb systems. Automotive Lighting's full LED headlamps are on the Audi R8 and A7, and the new Mercedes CLS, for which a total of 71 LEDs are used in the headlamps to provide various light patterns for turns, adaptive lighting and fog lighting. "You have complete freedom, within the legal requirements, due to the fact that you have a distributed light source [and] you can create more or less a complete new style," Mathausek said. Automotive Lighting believes that, by 2014, as many as 50 car models will offer at least LED low-beam headlights.